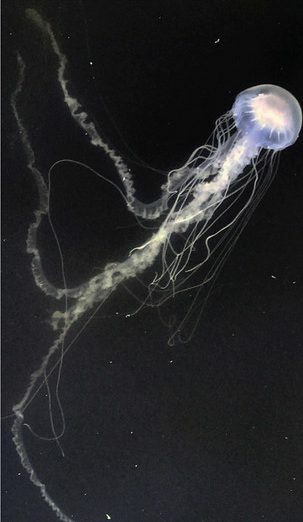 Chances are, if you’ve been stung by a jellyfish along the Chesapeake Bay it was by a sea nettle jellyfish–one of the most common and well-studied jellyfish species found along the East Coast and the Gulf of Mexico. 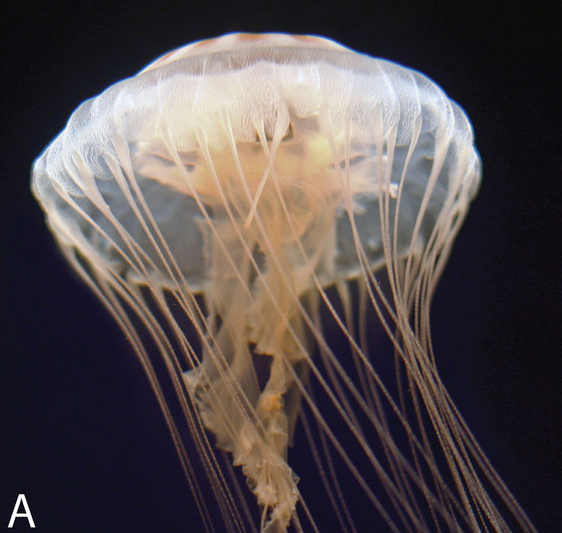 Now, a new paper published in the journal PeerJ reveals that the sea nettle jellyfish in the Chesapeake Bay are actually a different, distantly related species from sea nettles found in the open ocean. For the last 175 years, scientists have assumed these two common jellyfish were a single species. Keith Bayha, a research associate at the Smithsonian’s National Museum of Natural History, was conducting fieldwork and collecting jellyfish off the coast of Delaware (Cape Henlopen) when he noticed something different about the jellyfish nearby. “They were much bigger than anything I had seen previously,” Bayha recalls. His curiosity piqued, he decided to take some samples back to the Natural History Museum. Genetic testing revealed these animals were quite different than those found in the nearby Chesapeake Bay and Rehoboth Bay. Bayha then began a close study of these jellyfish with Patrick Gaffney at the University of Delaware and Allen Collins from the NOAA National Systematics Laboratory. 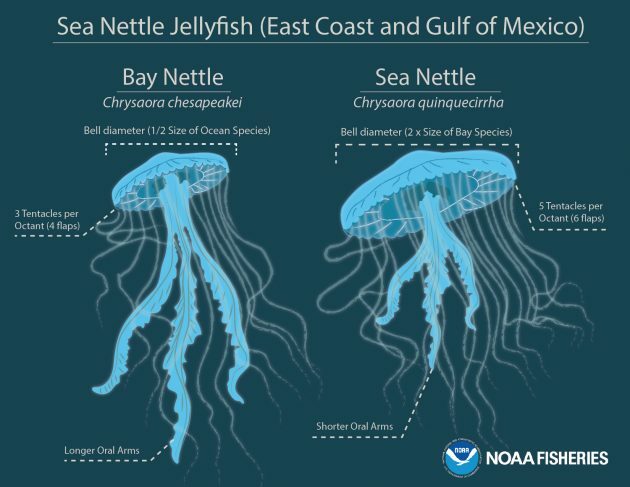 Together the scientists confirmed there were two distinct species–an open ocean-based species (Chrysaora quinquecirrha, “sea nettle”) and a bay-based species (Chrysaora chesapeakei, “bay nettle”). The bay-based species is found in the less salty waters known as estuaries, such as the Chesapeake Bay, and is the newly recognized species of the two. Both jellyfish were previously classified as Chrysaora quinquecirrha. 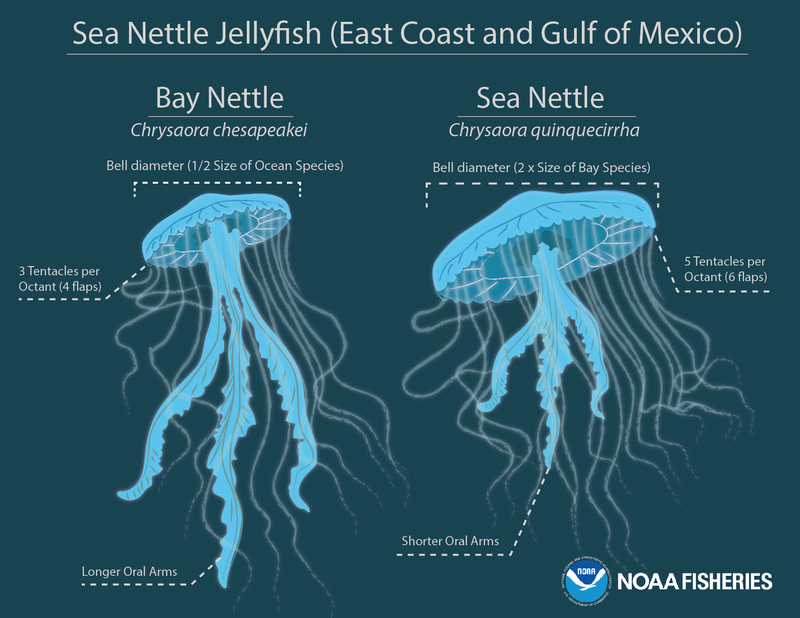 Even more surprising is that the new research shows that Chrysaora chesapeakei is more closely related to jellyfish off the coasts of Ireland, Argentina, and Africa than to the jellyfish found near Ocean City, Md., just a few miles away. The ocean-based species appears much larger than its bay cousin. Its bell (the rounded top portion of the species) is almost two times as large as the bay-based species. It also has more tentacles (40 compared to 24, although some variation exists). These differences and others are shown in the graphic below comparing the two species. Jellyfish do much more than sting unsuspecting beachgoers. Chrysaora chesapeakei it turns out is a friend to one of the region’s most iconic seafood species, the Eastern oyster. By devouring a type of comb jelly or ctenophore known as Mnemiopsis, which is a key predator of oyster larvae, the bay sea nettle gives the young oysters a better chance at survival. Jellyfish also serve as a key food source for some fish and sea turtle species and provide protection for the young of some commercially important fish species like jacks. The identification of a new sea nettle jellyfish adds to the roughly 200 species of true jellyfishes worldwide. “To manage a species you have to first know what it is, and we still have a way to go for jellyfishes and other marine species,” Collins says. The environmental conditions required for each jellyfish species to thrive are likely to be quite different.